Embed the meetings widget in one of your pages to allow visitors to book time with you while they're on your site. 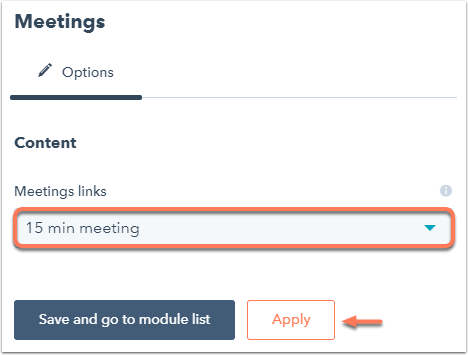 To embed the meetings widget on a HubSpot page, install the Meetings module created by HubSpot and add this module in your page templates. Then, customize the meeting link for the widget on the page. In your HubSpot account, navigate to Marketing > Files and Templates > Template Marketplace. In the upper right, search for Meetings. You'll see a listing for the Meetings module. Hover over the listing for Meetings module, then click View details. In the upper right, click Get module for free to install the Meetings module in your HubSpot account. In the finder, click the name of the template. In the template inspector, click + Add. Search for the Meetings module, then drag and drop it into the desired area in the template. In the upper right, click Publish to add the meetings widget onto all HubSpot pages using this template. Hover over the page with the meetings widget and click Edit. In the page editor, click the Meetings module. In the left pane, click the Meetings links dropdown menu and select the meeting link for the widget, then click Apply. In your HubSpot account, navigate to Sales > Meetings. Hover over the meeting and click Embed. Paste this embed code into the code of your external pages to display the meetings widget to visitors. The widget will be displayed on your page where the code is inserted. In the left sidebar menu, navigate to Sales > Branding. Click Upload to add a logo and under Primary color, select the color for your meetings widget. Please note: the Branding settings apply to all users in your account for all sales features except the messages tool.